Scouts who complete the Wood Badge training are recognized with insignia consisting of the Wood Badge beads, 1st Gilwell Group neckerchief and woggle. The beads, which represent bravery and leadership, were first presented at the initial leadership course in September 1919 at Gilwell Park. The woggle is a two-strand version of a Turk's head knot, which has no beginning and no end, and symbolizes the commitment of a Wood Badger to Scouting. The origins of Wood Badge can be traced to 1888, when Baden-Powell was on a military campaign in Zululand (now part of South Africa). He pursued Dinizulu, a Zulu king, for some time, but never managed to catch up with him. 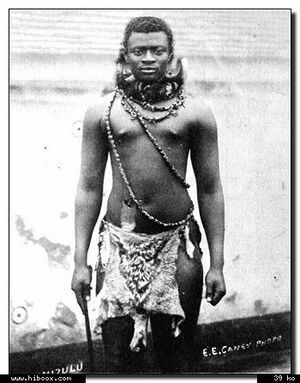 Dinizulu had a 12-foot (4 m)-long necklace with more than a thousand acacia beads. Baden-Powell is said to have found the necklace when he came to Dinizulu's deserted mountain stronghold. Such necklaces were known as iziQu in Zulu and were presented to brave warrior leaders. Much later, Baden-Powell searched for a distinctive award for the participants in the first Gilwell course. He constructed the first award using two beads from Dinizulu's necklace, and threaded them onto a leather thong given to him by an elderly South African in Mafikeng, calling it the Wood Badge. 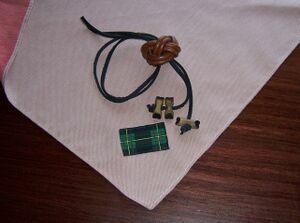 The neckerchief is a universal symbol of Scouting and its Maclaren tartan represents Wood Badge's ties to Gilwell Park. The neckerchief, called a "necker" in British and Commonwealth Scouting associations, is a standard triangular scarf made of dove-grey cotton (wool is available on special order) that has a patch of Clan MacLaren tartan at the point. The pattern was adopted in honor of a British Scout commissioner who, as a descendant of the Scottish MacLaren clan, donated money for the Gilwell Park property on which the first Wood Badge program was held. Originally, the neckerchief was made entirely of triangular pieces of the tartan, but its expense forced the adoption of the current design. The neckerchief is held together by a tan or brown leather Turk's head knot woggle. Additional beads are awarded to Wood Badgers who serve as part of a Wood Badge training team. One additional bead is awarded to Assistant Leader Trainers (Wood Badge staff) and two additional beads are awarded to Leader Trainers (Wood Badge course directors), for a total of four. As part of a tradition, five beads may be worn by the "Deputy Camp Chiefs of Gilwell". The Deputy Camp Chiefs are usually the personnel of National Scout Associations in charge of Wood Badge training. The fifth bead symbolizes the Camp Chief's position as an official representative of Gilwell Park, and his or her function in maintaining the global integrity of Wood Badge training. The founder of the Scouting movement, Robert Baden-Powell, wore six beads, as did Sir Percy Everett, then Deputy Chief Scout and the Chief's right hand. Baden-Powell's beads are on display at Baden-Powell House in London. Everett endowed his six beads to be worn by the Camp Chief of Gilwell as a badge of office. Since that time the wearer of the sixth bead has generally been by the director or leader training at Gilwell Park. The kudu horn is another Wood Badge symbol. Baden-Powell first encountered the kudu horn at the battle of Shangani, where he discovered how the Matabele warriors used it to quickly spread a signal of alarm. He used the horn at the first Scout encampment at Brownsea Island in 1907. It is used from the early Wood Badge courses to signal the beginning of the course or an activity, and to inspire Scouters to always do better. The grass fields at the back of the White House at Gilwell Park are known as the Training Ground and The Orchard, and are where Wood Badge training was held from the early years onward. A large oak, known as the Gilwell Oak, separates the two fields. The Gilwell Oak symbol is associated with Wood Badge, although the beads for the Wood Badge have never been made of this oak. Wolf Cub leaders briefly followed a separate training system beginning in 1922, in which they were awarded the Akela Badge on completion. The badge was a single fang on a leather thong. Wolf Cub Leader Trainers wore two fangs. The Akela Badge was discontinued in 1925, and all leaders were awarded the Wood Badge on completion of their training. Very few of the fangs issued as Akela Badges can now be found. ↑ 1.0 1.1 1.2 Orans, Lewis P. (2004). "The Wood Badge Homepage". Pinetree Web. http://pinetreeweb.com/woodbadg.htm. Retrieved 2006-08-01. ↑ 2.0 2.1 2.2 2.3 2.4 2.5 2.6 2.7 2.8 "The Origins of the Wood Badge". ScoutBase UK. 2003. http://www.scoutbase.org.uk/library/hqdocs/facts/pdfs/fs145001.pdf. Retrieved 2007-01-04. ↑ 3.0 3.1 3.2 "The origins of the Wood Badge". Johnny Walker's Scouting Milestones. 2006. http://www.scouting.milestones.btinternet.co.uk/woodbadge.htm. Retrieved 2007-01-21. ↑ Hillcourt, William (1964). Baden-Powell: The Two Lives of a Hero. London: Heinemann. pp. 358. ↑ "iziQu". African History. About.com. http://africanhistory.about.com/library/glossary/bldef-isiQu.htm. Retrieved 2007-01-04. ↑ Block, Nelson R. (1994). "The Founding of Wood Badge". Woodbadge.org. http://www.woodbadge.org/founding.htm. Retrieved 2006-07-20. ↑ "Clan MacLaren and the Scouting Connection". Clan Maclaren.org. 2004. http://www.clanmaclarenna.org/CMSNA/home.nsf/7cf3963177286e1586256c5a00489ae2/1242531143eabbbd86256c90007fff88!OpenDocument. Retrieved 2007-01-21. ↑ "History of Wood Badge". Scouting.org. http://www.scouting.org/factsheets/02-539.html. Retrieved 2007-01-05. ↑ Barnard, Mike (2000). "The Kudu Horn and Scouting". Woodbadge.org. http://www.woodbadge.org/kuduhorns.htm. Retrieved 2006-07-26. ↑ "The history of Cubbing in the United Kingdom 1916-present". ScoutBase UK. http://www.scoutbase.org.uk/library/history/cubs/. Retrieved 2007-01-04. This page was last edited on 3 June 2017, at 17:13.